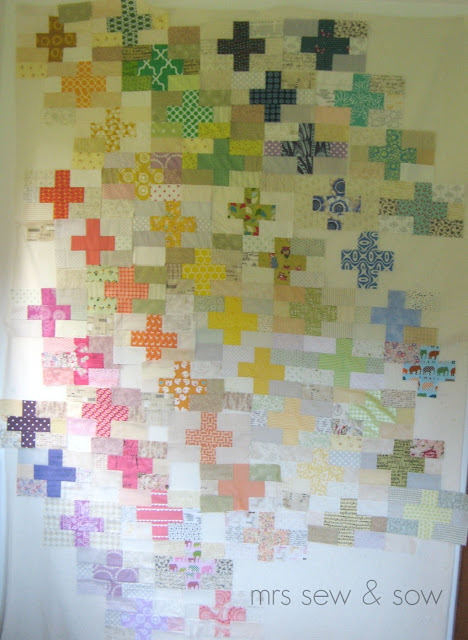 I have been playing with the cross blocks from my Stingy Bee mates. I am sewing them together in an offset layout. I learnt how from Sarah Fielke - ok it was a craftsy class rather than flying off to Australia but I enjoyed it. Three rows sewn together...the greens, the yellows and the oranges. 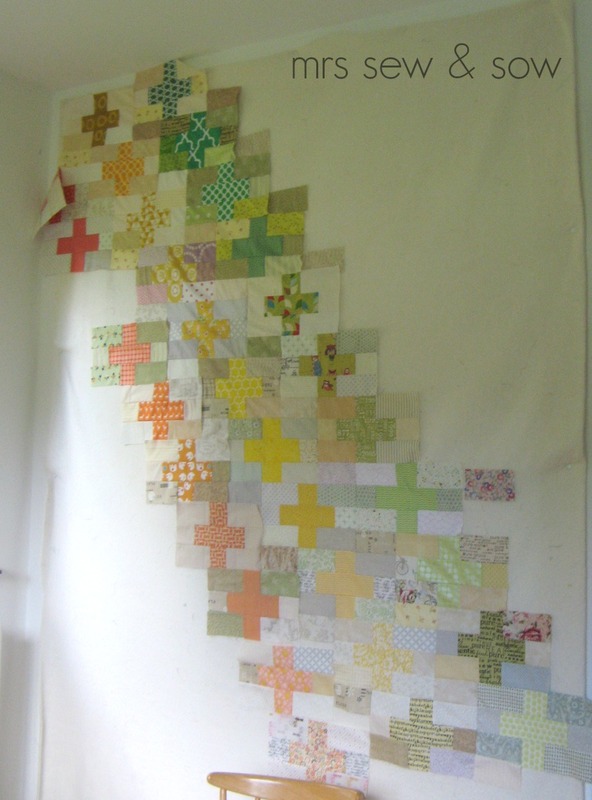 ....and here's what I hope it will look like when I've sewn all the blocks together. There may be some more blocks to arrive and to make but I'll be happy enough to do that. I started with the darker colours at the top left and drift down to the lighter ones at the bottom right. Not quite sure yet how I'll finish the edges off - but I'm sure it will all come clear in time! Good morning. It will be AMAZING ! *sigh* if only I had a tenth of your quilty drive!!! You are amazing. It looks wonderful! Great way to use favorite scraps! Fabulous! That will be stunning. Have loved this from the very beginning. Keep going! Ooooohhhhhh this really is so lovely! This is an excellent example of why I need a design wall. Beautiful colours. This quilt is going to be a stonker. Oh, it's incredible! I adore it! Beautiful! I love it and of course now I want one too. Love that offsetting - whole quilt is going to be brilliant! LOVE this Nicky! Rainbow crosses on a low volume background. I don't think it gets better than that!!! This is just awesome! Great great use of the blocks...love how they flow from dark to light. Keep stitching! oooh yummy, but all those Y seams!!!!! !